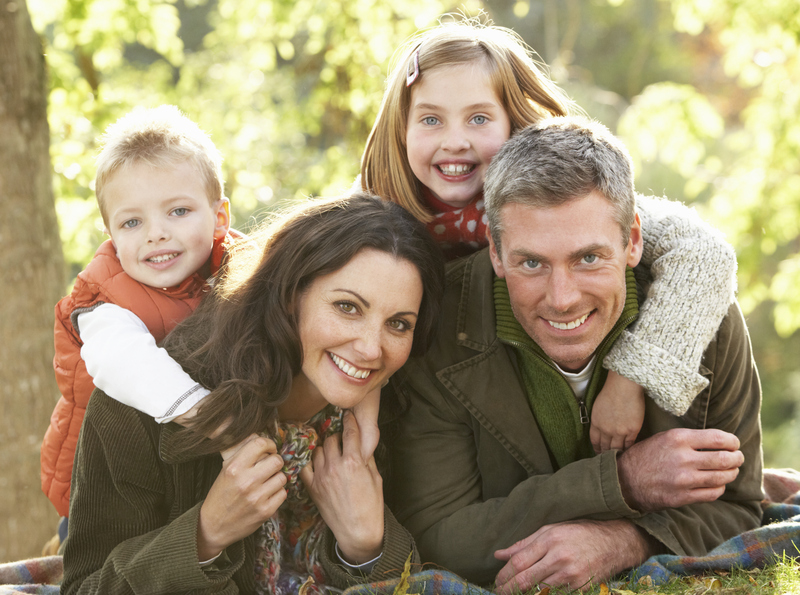 How Can WinterPromise Help You Build Your Own Family Culture? 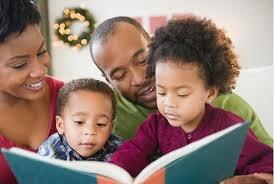 WinterPromise was built from the get-go to promote and support your family, to build a family’s own internal culture. How? By Providing Themes Family Can Work Through Together . . . Most of our themes are designed to keep your family learning together — not divide and separate you. We have themes to help unite families that include a lot of different age ranges, and themes that will work as your family grows older. Your family will study history, culture, or history together, and yet still find practice in skills areas (such as language arts and math) that are perfect for their individual grade levels. 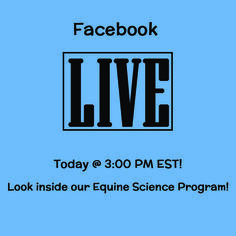 By Working Through High-Interest Topics That Keep Kids Intrigued . . .
Each day your kids come together to learn, they’re ready to absorb something — it just has to be interesting, capture them in some way. We here at WinterPromise figure there’s just no reason at all that learning has to be dry or dull. Interest kids, and they’ll take off on their own. That’s why so many families write in to tell us stories of how kids don’t even consider their WP themes “school,” but fun! We love hearing that — and love knowing that kids all over are inspired by their own joy in learning! This joy gets them extending the learning into playtime or even work time, creating their own culture as they go. 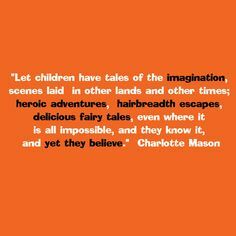 By Offering Resources That Get Kids Imagining . . .
What’s better than finding that your kids have taken the germ of an idea and run with it? You see it come to life, and see their soul in what they’ve created. 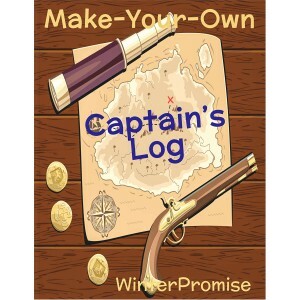 WinterPromise resources are designed to trigger that process. From ideas on making historical hideaways to creating medieval signboards or a Roman milestone, we give families the kinds of projects, experiments, and hands-on challenges that get kids creating and imagining. It’s a great place to make memories, and your own fun culture, remembering what you did, when. By Leading You to Experiences That Help Create Unique Family Memories . . . Yes, WinterPromise offers you practical activities you’ll actually do, but WP also offers tons of ideas for other kinds of experiences, too. You’ll encounter ministry and service opportunities, ideas for field trips, ways to visit virtual museums or landmarks, instructions for trying out real-life skills, as well as historical games or recipes. All of it can be done together. They teach older kids to be good leaders and managers, get younger learners cooperating, and pass along new skills to everyone. As you go, of course you run into experiences that turn into fun or embarrassing moments. That’s just more memories, more family culture, more stories to share. By Providing Great Discussion Opportunities Around Every Corner . . .
One of the best things about WinterPromise is how the resources we bring you create opportunities for your family to discuss the really important things. You’ll find it in resources like our “Prayer and Personal Involvement Journal” from our “Children Around the World” program, a resource that specifically gets kids thinking about how much they have that others do not, and how that links up to their understanding of the world around them, what they need to do about it. Resources like this one are sprinkled throughout our curriculum, and provide the springboard parents need to talk about the really important things with their families. The kinds of things that sometimes get lost amidst finding toothbrushes or walking the dog. More opportunities to talk about the important things equals more time to pass along values, more time to build character, more time to really know one another, more time to mentor and serve one another. That’s the best kind of family culture. The kind we here at WP want to help you build! Why not try WinterPromise and see for yourself? Back before WinterPromise was born, back when my kids were younger, and WinterPromise was just our own family lifestyle, not a curriculum, we discovered that our family experiences provided windows into the souls of our kids. That each of the things we did together, enjoyed together was an opportunity to see inside them. A prime example was our family’s love for Playmobil. If you’re not familiar with Playmobil, you’re really missing out. Playmobil is a combination building and relating toy. Sets of Playmobil allow kids to build houses, businesses, firehouses or adventure scenes, while also including people, animals, furnishings, and vehicles to allow imaginations to run wild. Better still, many of the toys are based in historical time periods such as the age of piracy, the American West or Civil War, and medieval times. Our family used these toys not only for hours of imaginative play, but as directed props in recreating our favorite scenes from our history books. The kids named the characters after people we read about. A little guy with a map and a sextant became Nathaniel Bowditch (of “Carry On, Mr. Bowditch), while western heroes and villains like Wyatt Earp or Billy the Kid carried out frontier justice or broke out of jail. 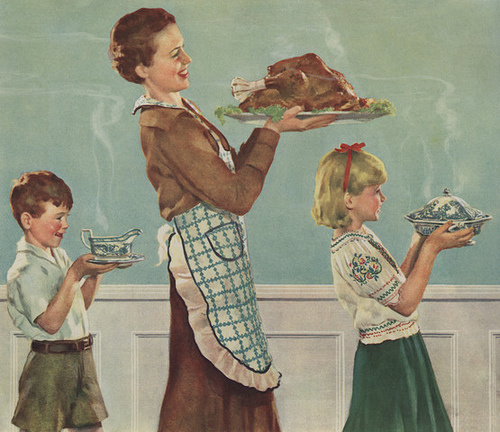 For hours our kids would re-enact what they’d been taught in elaborate scenes. Some were pitched medieval battles, others were slowly unfolding chases or taut moments in history. Either way, they built it and populated it with Playmobil and their own imagination. It was the ultimate narration tool! But equally fascinating was how these experiences provided windows into the hearts and souls of our children, allowing us to see not only what they’d learned, but who they were becoming as people. While the girls of the house fastidiously decorated castles for soon-to-arrive hostile forces, the boys arranged their weapons and set elaborate traps around the perimeter. When the battle came on one of the girls could be heard tenderly whispering to a victim, “Hold on, help is coming!” while the boys’ shouts bared souls filled with courage and sacrifice, protection for the helpless (or hapless) souls inside the castle. 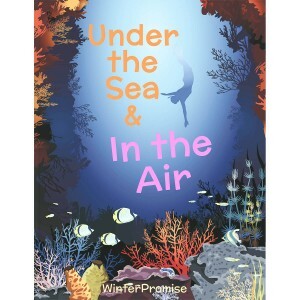 In short, the experiences were “soul windows,” peeks inside the true character of our children. What they’d do in ‘real life’ in the same situation, practicing acts of kindness or bravery. A million facets of the complex people they were to become. Here at WinterPromise, we offer you a variety of experiences in part because each of them provides a “soul window” for you as a parent. Not only are they designed to provide rich learning opportunities, but they are deliberately constructed to give you a great chance of peeking inside your child’s very soul. These are the opportunities we have to change our child’s character, praise him for his gifts, smooth off rough edges, polish up the best in them. 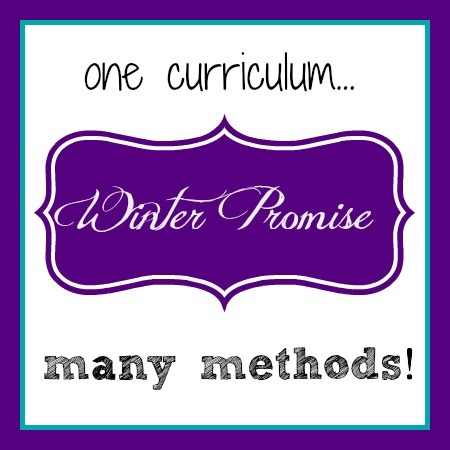 For us here at WinterPromise, we hope to bring you a curriculum is living, well beyond just an educational experience — one that allows you to ‘bring up your child well,’ to mentor and grow them, to reach for the best in them and make them blossom and bring joy to those around them. This should be the ultimate goal of education. It was Charlotte Mason’s goal, and it is our goal. And every one of our children deserves nothing less than that. 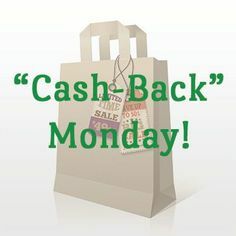 https://winterpromise.com/wp-content/uploads/2013/10/147562659.jpg 3867 2578 kaeryn https://winterpromise.com/wp-content/uploads/2018/02/A_WinterPromise_Blue-Green_Transparent_Lined_Small_v2-300x58.png kaeryn2013-10-29 15:30:202015-01-21 11:21:47WP Experiences are "Soul Windows"
Just What is WinterPromise’s Experience Approach? Just What Does WinterPromise Mean When They Say They Offer the “Experience Approach”? What is the “Experience Approach”? 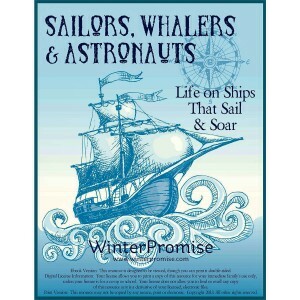 Unlike other curriculums that focus largely on literature, or workbook pages, or textbooks, or even highly involved activities, WinterPromise is just brimming with all kinds of experiences: learning experiences, real-life experiences, and so much more. 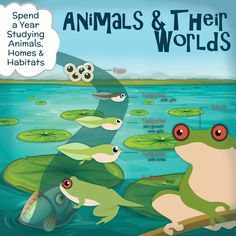 Kids can be getting out into nature for one class, creating a history notebook for another, building a model for a different class, or trying out a real-world skill in yet another! What does this variety of experience mean for families? It means that each day is a new adventure, for one — and each WinterPromise theme offers its own unique set of experiences. There’s literally a different “feel” to each program, since each theme has its own amazing take on how students “experience” the time period for themselves. But it also means that, for families with multiple students, each one can pick the learning experiences that most connect with them personally, if they like. This keeps students motivated and intrigued, and yet keeps families building a common family culture. Each student is uniquely challenged, and yet the entire family gets to enjoy common experiences, too! Learning Experiences: These experiences are more generalized learning experiences, those that allow students to take in information. 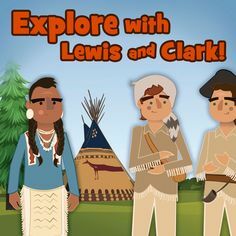 These might be called “traditional” learning experiences that include reading and discovering content in books, listening to oral histories or music, seeing new things for oneself in everyday surroundings or at landmarks, parks. or important places, either in person or through pictures or video. Geographical Experiences: In WP, students discover geography in a variety of ways — through study of countries and their lands, by mapping both places and topics in time, and following how geography affected history and the unfolding of human trends and development. Geography is integrated in different ways to help students think all the time about how the land affects how events take place. Natural Experiences: A key part of WinterPromise study is nature study and other natural experiences. 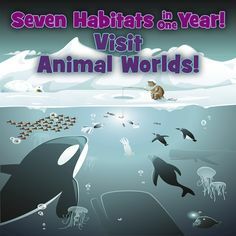 As students discover themes, there are integrated activities that have them also getting to know the natural world that was a part of history or scientific discovery, or even catastrophic events. Students spend time creating eco-journals, and discovering the trees, plants, animals, and physical forces that affect our lives every day, and have dictated world outcomes in the past! Real-Life Experiences: A hallmark of WinterPromise learning are our real-life experiences. These creative activities get kids trying out true-life skills, things that are needed and important in the real world. 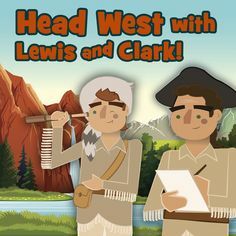 These experiences not only help them understand key historical figures, but also help them understand different times and places. Plus, they whet their appetite for enjoying things they may never have considered pursing otherwise. AND, they help build real-world confidence in themselves to experience success with new things! Online Experiences: Getting kids familiar and productive with computers is another thing you can count on with WP. Not only does it give them skills they will use for a lifetime in almost any workplace, but getting them online opens up a world of amazing experiences. Online, students can visit places they’d never go in real life, or get a chance to see something up close that is locked away in a museum vault or under glass in an exhibit. They can hear from experts they could never talk with, and even attend online courses or seminars, or watch online videos and biographies. Creative Experiences: Kids and parents alike love all the creative experiences WP suggests. Our activities are never pie-in-the-sky, but are well-thought out to bring you the highest possible educational value for the lowest possible prep or expense. WP’s creative experiences are unmatched in this regard. Parents love how the experiences really get kids thinking, demonstrate principles of science or history or humanity or culture, and how the experiences themselves are built to make it “stick” inside a kids’ head! Creative experiences can be drawing, painting, building, designing, recreating, photographing, videoing, cooperating, demonstrating — the list goes on and on — and all of it highly educationally rich! 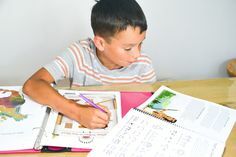 Notebooking Experiences: Not only does WP offer your student one of the most unique timeline notebooks available for homeschoolers, but we also help them build a “Make-Your-Own” History Book with looseleaf notebooking pages they collect year after year. These notebooking pages are designed to be interesting and very interactive, demonstrating historical or scientific concepts, adding more rich content to student study, or helping students show what they know in a unique and fun way! Working Together Experiences: Collaboration is another great way to learn, and WinterPromise integrates these kind of “together” experiences all the time. 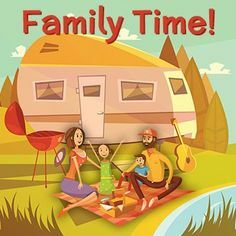 They’re great because they build family cooperation and unity, and give your family wonderful shared experiences to laugh about and remember later! Whether students are putting on a play, creating a historical video, or cooking up a cultural dinner, they’ll learn a lot — and enjoy it in a different way — by doing it together. DVD Experiences: WinterPromise also recommends key DVD picks for students who connect with this avenue of learning. There’s nothing like seeing how Vikings used the same kind of boats in the open sea and inland rivers, or finding out what Civil War soldiers endured during battle and in between. These come alive in good quality videos, and our picks let you choose which ones you’d like to get from the library or buy for your family. Either way, it offers another great way to “experience” history, science, or culture. Service Experiences: There’s no better way to teach your values to your kids than getting them serving in your community or church, or volunteering to help those who are less fortunate or challenged in their everyday lives. That’s why WP suggests opportunities that get kids giving in some way to others. These service experiences help you as a parent to teach them contentment and gratitude for the blessings in their own lives, while helping them learn how to serve and help others who really need it. They build real-life skills, and create tenderheartedness to the challenges others face, either right down the street, or around the world! These are just some of the different types of “Experiences” that WinterPromise offers to parents. Each one has an educational focus, not busy work. This means no matter what kinds of students are in your family, there is something for everyone in our family-oriented packages. 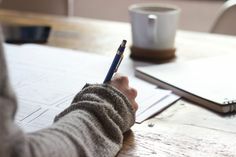 The experiences WP offers are based on the Multiple Intelligences, and each scheduled activity appeals to one or more of these learning avenues that connect with a certain type of learner. No matter how many different kinds of learners are in your family, there are plenty of experiences just right for them! PLUS, WinterPromise is always focused on how each experience can change the heart and the character of the learner. How cool is that? THAT’S the “Experience” Approach! That’s WinterPromise! https://winterpromise.com/wp-content/uploads/2013/10/Experience_Approach_Header_Larger.jpg 90 576 kaeryn https://winterpromise.com/wp-content/uploads/2018/02/A_WinterPromise_Blue-Green_Transparent_Lined_Small_v2-300x58.png kaeryn2013-10-21 14:33:482014-02-25 14:32:55Just What is WinterPromise's Experience Approach? 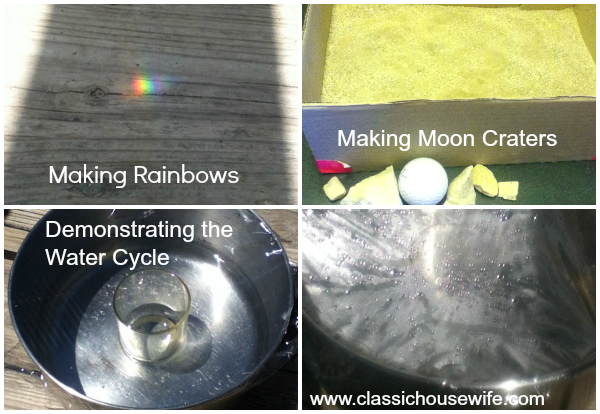 One of the ways to incorporate more science into your school day is with simple nature study! Charlotte Mason (and Winter Promise!) believe that nature study is one of the best ways to learn about the world around us. Do you take nature walks with your family? Such a simple, yet fun and meaningful, way to study nature AND make family memories at the same time! 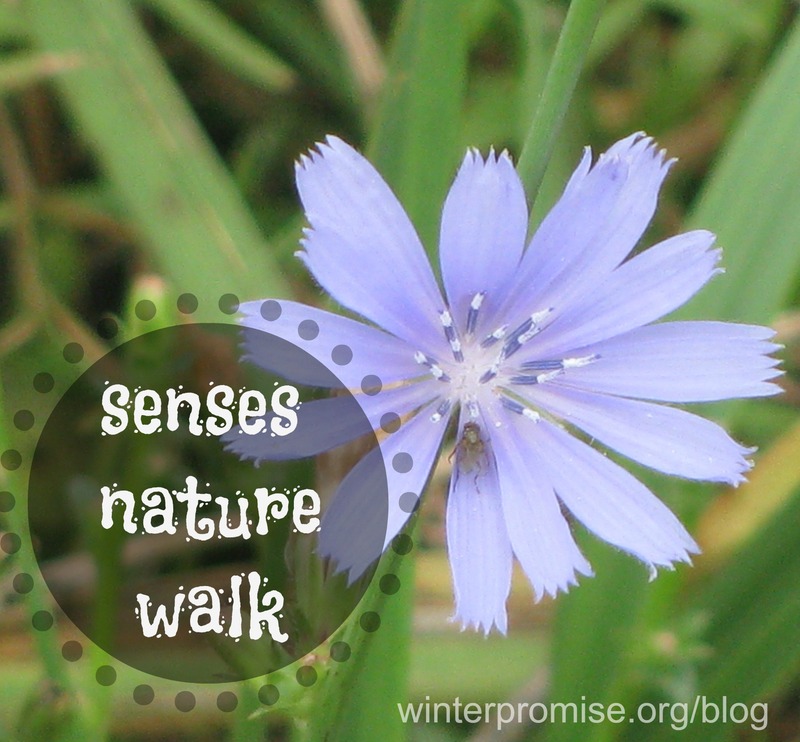 Nature walks is one of the 5 simple ideas for nature study that we shared earlier! If you’ve taken nature walks before, this week, why not try a NEW way to take a nature walk? Go on a SENSES SCAVENGER HUNT! 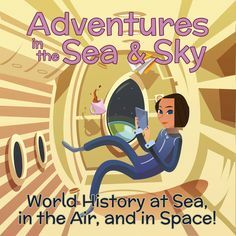 In our science program called The World Around Me, this is one of the many wonderful experiences you will share with your child! Why not try it today? 1. Ask your child if they can name their senses and know what they are. 2. Discuss each sense and how it helps us to discover the world around us. 3. Explore one sense at a time as you walk. 4. As you start your walk, ask your child what hidden treasures he can find with his EYES and sense of sight. 5. Continuing along, ask your child what fascinating parts of creation he can HEAR with his ears. 6. Make it a game! Tell your child you SPY something that they could explore with their sense of TOUCH. 7. Still walking, see if your child can name anything they can SMELL with their nose. 9. In a later nature post we will discuss keeping a nature journal, but for now, if you don’t have one, just grab a piece of paper and have your children try to recall all the things they found on their SENSES SCAVENGER HUNT. Discuss with your child the TREASURES that we have all around us to explore in the world around us! Find more nature study inspiration on our Nature Study pinterest board! We would like to share some simple ideas for nature study! I hope you’ll join us for this series. We love nature study in our home!! 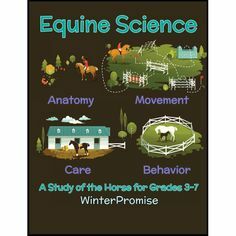 And Winter Promise loves nature study, too! Like Charlotte Mason, we believe that there is much JOY to be found in studying and observing nature and God’s creation all around us! We love making memories together as a family, and one wonderful way to do this is through nature study! But, don’t make it too hard! It doesn’t have to be! 1. 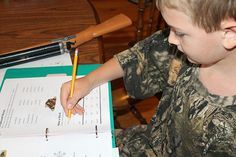 Keep a SIMPLE nature notebook or journal with your child! The key to this is keep it simple. You don’t have to go out and buy anything fancy. Just take a simple notebook, some colored pencils, go outside and EXPLORE. Have your child draw, label and date what they see! 2. Go on regular nature walks. This is as simple as simple gets, but I know that for me, at times, I let all the other “stuff” of our homeschooling day get in the way of what could be the best part of our day! Getting outside, enjoying fresh air, admiring God’s beautiful creation around you, time with your children…these are all fabulous reasons for taking nature walks with your children! 3. Explore your own backyard. I love taking little “breaks” in our homeschool day, walking out into the backyard with my kids and “assigning” them a corner of our yard to explore. Sometimes we take our nature notebooks and I have them find ONE thing to draw in their corner of the yard. Sometimes we just take a magnifying glass and see who can find something interesting to look at. It can be so simple, but so meaningful. 4. Study one something from nature in your own yard. Choose a tree, a flower, an animal, a bug…something you can view regularly in your own backyard. Watch it, draw it, look at it in different seasons, describe it, check out a book from the library on it. 5. Bring nature indoors for study. 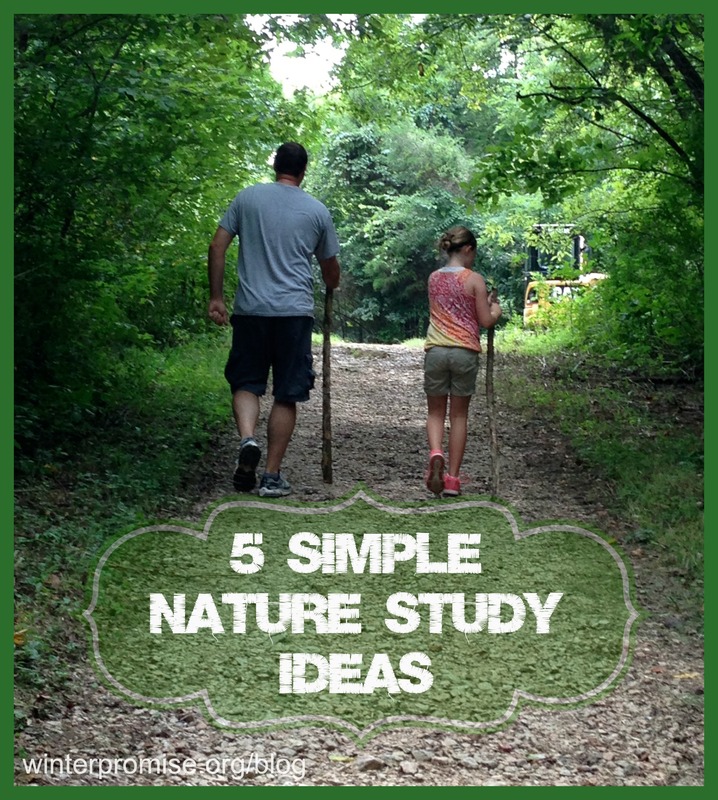 This is another of my favorite nature study ideas! Create a nature table (or corner, or shelf) in your home. 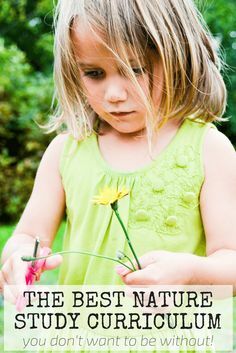 Admire the beautiful flowers, rocks, twigs, leaves, and other items with your children. Bring them inside and set them in a place to explore and admire even more! Start a collection with your children. Discuss, admire and examine many different nature items in your home to build observation skills and admiration skills in your children! 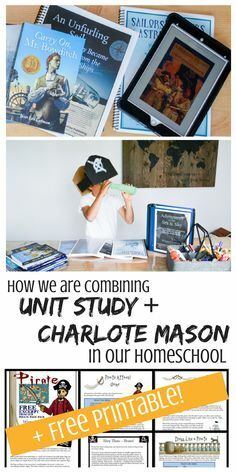 Be sure to check out our Nature Study pinterest board & Charlotte Mason pinterest board! We love sharing how you are using Winter Promise in your homes! 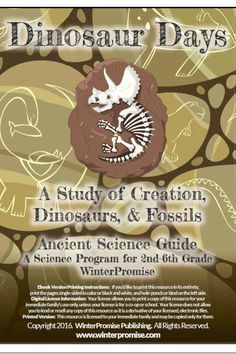 Leigh, from Little Homeschool in the Woods shares about starting off their new year with Winter Promise! Amy, from A Nest in the Rocks, had an English Tea party to start off their Children Around the World year!! 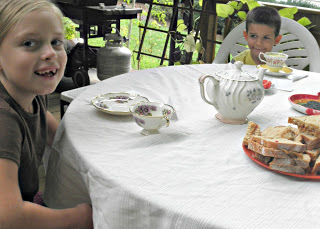 Read more about their tea party and how they are using Winter Promise in their home on her recent post. Amber, from The Classic Housewife, is using our Dinosaur Days program with her science loving son who was eager for more science! It looks like they are having a great time! Read more about their fun with Dinosaur Days AND enter her give away for this program which will end on August 16th. 9 approaches in ONE curriculum? 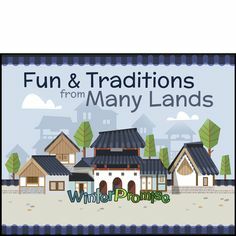 https://winterpromise.com/wp-content/uploads/2013/07/many-methods.jpg 450 450 Candace Crabtree https://winterpromise.com/wp-content/uploads/2018/02/A_WinterPromise_Blue-Green_Transparent_Lined_Small_v2-300x58.png Candace Crabtree2013-08-02 09:30:472013-08-02 09:30:479 approaches in ONE curriculum?